Last weekend the flagship Topshop on Oxford Street in London was turned into a giant playland of retail fun and we loved it, not only because it was both playful and fun but because of the way it seamlessly blended a live activation with real time social technologies. 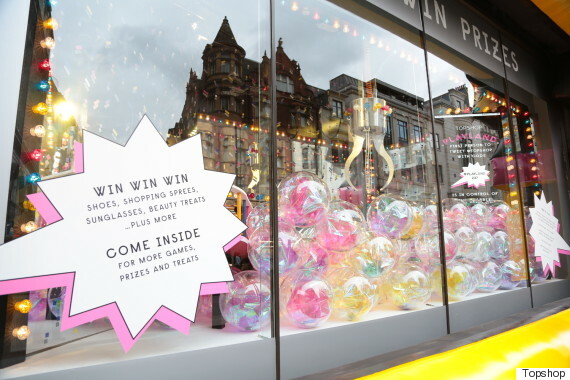 The iconic front window of the store was transformed into a giant arcade game claw powered by live tweets from the public. Shoppers were invited to tweet a code and release the game, giving them a chance to win anything from a lipstick to a £500 shopping spree. This integration of the social and live activations pushes the reach and creates a 360° experience which helps to cement the social currency of the brand. 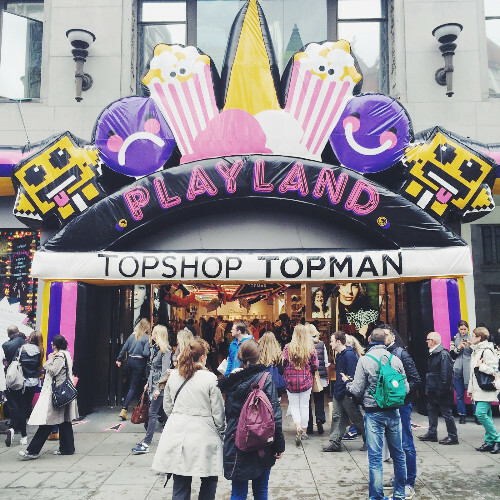 This added to an inflatable shop front, blue popcorn, old school Pacman games, coin push give-away machines, stickers, balloons and the always amusing Zoltar giving fashion predictions created the perfect adult playground and generated massive social reach across Twitter and Instagram. Excited shoppers uploaded images of the fantasy land throughout the weekend, showing how a careful executed activation has reach way beyond the initial experience and places the brand into the life of its customers, creating an audience for its products by social word of mouth. Turning the whole store into an instant pop-up shop demonstrates how retailers can become their own experience, giving shoppers shock and delight within their own well establishment environment. Showing you don’t have to go on the road to create a different experience and present your brand in a new way. Putting social technologies at the heart of an activation and not as an add on while at the same time not solely relying on them creates a full experiential experience which not only works for the shopper in the store but the social user looking on wishing they were there, creating instant FOMO. The blend was pitch perfect for us in this activation and that’s why we love it! How is your brand creating shock and delight for its audience? Get in touch to see how we can help your brand create impact and reach from your activations.